The French Navy faces a whole range of challenges to keep its Ships and Sailors safe at every decisive moment during their Operational Missions. High on the list of priorities is the ability to detect and track all types of above-water threats, both conventional and asymmetric, at all times. The Charles de Gaulle has just been equipped with the latest High-Tech Systems as part of a halfway major Refit conducted under the management support of both the French Defence Procurement Agency (DGA) and the Fleet Support and Service (SSF) currently being finalised. One such Capability Upgrade is ARTEMIS, a Passive Infrared Search and Track (IRST) System that uses three fixed sensors integrated into the topside architecture to perform Surface Surveillance out to the horizon at all times of day and night. Developed by Thales, ARTEMIS helps to guarantee the maximal level of Situational Awareness and Protection needed to insure the survivability of the ship itself and other vessels in the area. Operating alone or in combination with other sensors, the system automatically detects tracks and classifies a broad array of Airborne, Maritime and Land-based threats. The three fixed sensors provide 360° Panoramic Surveillance of the Surface and the Coast, with no blind spots, day and night. With Advanced Electronic Image Stabilisation and data refresh rates 10 times higher than a Scanning IRST System, ARTEMIS Detects and Classifies threats faster than earlier generations of sensors. ARTEMIS is already operational onboard FREMM Multi-Mission Frigates in service with the French, Moroccan and Egyptian Navies. 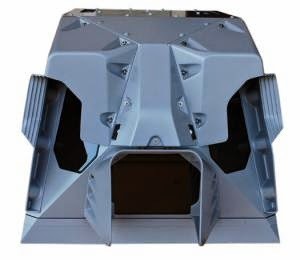 In Canada, Thales and DRT Technologies are working together to develop and promote the OMNISTARE System, a derivative of ARTEMIS, for the fifteen new Frigates on the Canadian Surface Combatant programme.